All applicants must have fulfilled the minimum education requirements of 90 semester credits (equivalent to 135 quarter credits) of general education from a regionally accredited degree-granting college or university, with a minimum of 2.75 GPA. Up to 30 semester credits of general education may be earned through successful testing assessment using a combination of acceptable assessment modalities such as: College Advanced Placement (AP), College Level Examination Programs (CLEP), American College Testing Proficiency Program (ACT/PEP), and U.S. Armed Forces Institute Programs (USAFI). Although you may be awarded credit for these testing assessments, some state licensing agencies may not accept these credits if they were awarded by non-regionally accredited institutions. 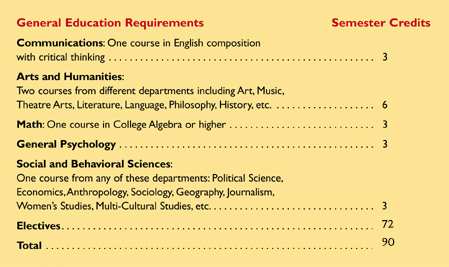 If you have not completed an AA degree or higher, your general education must include: one course in English composition with critical thinking, two courses from different departments in Arts and Humanities, one course in College Algebra or higher, one course in General Psychology and one course in Social Sciences. Each of these courses must be a minimum of three semester credits each, a total of 18 semester credits. The remaining 72 semester credits may include transferable coursework towards the DTCM degree or any other topic of your interest. For a list of approved, transferable courses please contact the admissions office. If you prefer to apply before you have met the educational requirements, the admissions department will provide pre-qualification counseling services to assist you with the necessary steps to become eligible for the DTCM degree program. The Admissions office provides Transfer Planning services to applicants who have completed coursework at a regionally accredited degree-granting college or university. Five Branches University has not entered into an articulation or transfer agreement with any other college or university. The DTCM program at Five Branches University requires five natural science courses: General Biology, Chemistry, Physics, Human Anatomy and Human Physiology, each with a minimum of three semester credits. It is highly recommended you complete the courses in General Biology, Physics and Chemistry prior to entry. These courses can be taken from a community college, university, or on-line. If these courses have not been taken prior to enrollment you may take them concurrently, within your first two years of study. Please contact the admissions director regarding transfer credit of natural science courses or for a list of approved schools providing these courses.